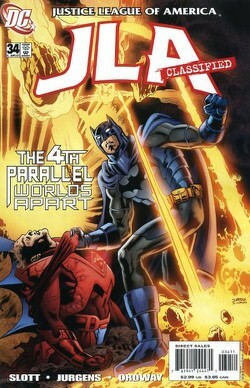 "The 4th Parallel" - Part 2B: "Worlds Apart"
Darrin Profitt's second attempt to destroy the Justice League goes disastrously wrong. In his Red King persona Darrin had crafted a Doomsday Weapon in an effort to extort the world into submitting to his supreme authority. The device accidentally goes off and Superman soon discovers that the world has ninety five hours before it is destroyed just like Krypton. The Justice League mobilizes a massive evacuation plan and after deciding to terra form Mars they go about gathering every creature and sample of plant life on the planet. Meanwhile Batman tracks down the man responsible and as the planet dies around him he makes sure that Darrin faces his final justice. Story - 5: Holy crud on a stick that was awesome! This issue was such a surprise. I expected it to be like the previous two chapters; innovative, entertaining and somewhat light hearted. Then Slott and Jurgens hit me with an end of the world scenario that was innovative and entertaining and did indeed have some lighthearted moments, but was also touching and kind of sad. For fans of Superman as he was published between 1987 and 1999 this issues was a real treat and I can say that because I am a fan of Superman as he was published between 1987 and 1999. (Not all of it, mind you, but still a fan.) Superman was the one who discovered the Earth was about to be destroyed and it was destroyed much like the Pre-Birthright Krypton was at the hands of Black Zero. Jor-El was definitely Pre-Birthright though the Kryptonian message had a more recent feel to it. (If you are curious, the message was, "Kal-El, Hear My Plea.") Even the ending with Superman watching the Earth die with Ma and Lois at his side felt "old school". So, on that level I was very pleased. The rest of the League, especially Wonder Woman and Batman, had some bright moments as well. It was interesting to watch Slott and Jurgens explore this scenario to the fullest and the little touches like Aquaman leading the creatures of the deep to Mars or John Stewart calling in some back-up and the shrinking of some of Earth's cities a la Pre-Crisis on Infinite Earths Brainiac were great. Even the scenes with Plastic Man and Flash were heart felt and strong. Everything about this chapter was fantastic and it is one of the most satisfying stories I have read in some time. It even had a cameo by Booster Gold and Blue Beetle. How can you not like a cameo by Booster Gold and Blue Beetle? Art - 5: The "old school" Superman feeling continued into the art. I expected Trevor Scott to continue the finishing chores, but one look at that artwork and I could tell that Jerry Ordway was involved. You can't miss it. Unlike Scott's finishes, which mirrored Jurgens' style, Ordway's compliments it. They bring about the best in each other and produce some great artwork. This was an emotional story and the art reflected that. It was also great to see a larger cast of heroes and Jurgens and Ordway certainly have experience with that. There's a reason I gave the art a rating of five. It was that good. Cover Art - 4: This was a really solid cover. As with the past two issues Jurgens and Nowlan come together to produce a very strong piece of artwork and while I didn't like this cover as much as the previous two I still can't complain. The Batman armor is interesting and the cover definitely made me want to check out the story.